So summer is slowly coming to an end, but the beach weather isn't over yet! To celebrate one final month of beaches and pools and nice weather, I created a list (shocker!).. the bag displayed is Obag Waterproof Beach Bag in Orange with Rope Handles , which looks big enough to hold all of my must-haves, comes in a cute color and the rope handles give it a nautical look. The best part though, is that it's waterproof and can be cleaned easily - a must for every beach adventure! 1) Neutrogena Ultra Sheer Sunblock Body Mist : sunblock is so important at the beach, and I love this one because it's a mist, so it doesn't get sticky and make your hands all sunblock-y (yes, I made up the word..), and because it also protects your skin in the way only Neutrogena does - so it's great for those with sensitive skin! 2) Cotton Beach Kaftan : how cute is this?! umm.. it's striped! need I say more? 3) Tommy Hilfiger Preppy Palm Beach Towel : this towel is too cute for words, and I think I'm gonna order one next week! It reminds me of Lilly in a way, but it's so cute, preppy and "Palm Beach!" must haveee! 4) Solid Floppy Beach Hat : every girl needs a big floppy beach hat to hide under, and to shade herself when she's reading books! I don't go to the beach without my floppy hat, and I live in a tropical island so that's saying something..
6) Waterproof Change Purse : I chose this waterproof change purse so you can throw loose change in without having to bring your entire wallet to the beach and risk losing anything. With this, you can throw $20 in and have it floating around your beach bag. 7) Vino2Go Double Wall Insulated Acrylic Wine Tumbler : I think this might be the greatest invention since sliced bread.. and I mean it. Um, are you seeing it?! It's a insulated wine glass to go! I don't know how beaches in America work, but you can pretty much drink anywhere in Trinidad, so why not bring some wine along for the beach adventure? My favorite way to read is poolside, sipping on some Prosecco. Yummm! 8) eos Lip Balm in Pomegranate Raspberry : I swear by these lip balms.. they're so cute and moisturize at the same time! Plus, the convenient shape allows you to reach every point of your lips, for ultimate moisture! 9) LifeProof iPhone 4/4S Case White/Grey : The last thing you want at the beach is something to happen to your precious iPhone - so this LifeProof case is a genius and probably the best accessory for any beach trip! It protects it from all the elements, and you can even take it underwater - just make sure everything's screwed in right! You don't want to be that guy who breaks their iPhone in the LifeProof case! So.. there you have it. 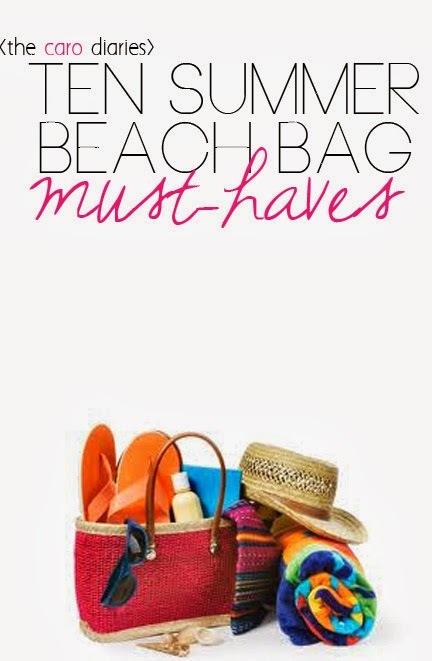 A Caribbean girl's picks for beach bag must-haves! Are you going on any beach adventures before the summer ends? I'd love to hear about it below! Also.. lucky for you, I've teamed up with a couple of my fave bloggers to bring you a giveaway! Caroline from The Caro Diaries is giving away 60 days of ad space! Jessie from JPerry Fitness is giving away a Shakeology sample, Shakeology Shaker Cup, and Shawn T's Fast & Furious Insanity DVD! Kristina from Kristina Does the Internet is giving away $15 Sephora E-Giftcard! 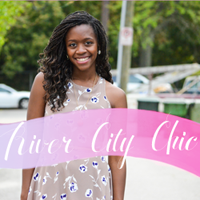 Alicia from River City Chic is giving away a $10 Target Giftcard! Ashliegh from The Darling Prepster is giving away 1 month of ad space! Enter now! The giveaway ends Friday at midnight PST, so around 3am EST! 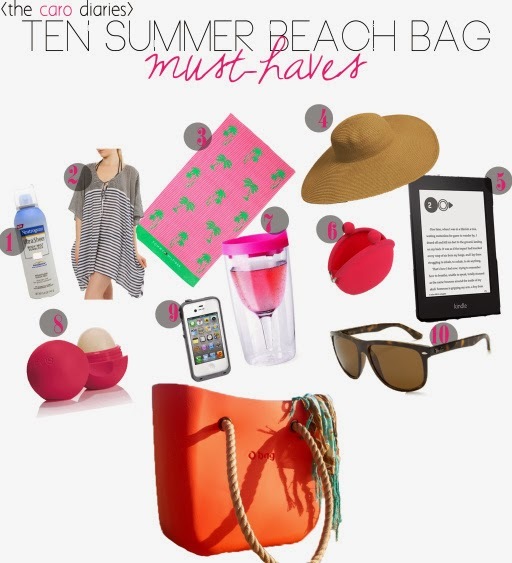 that bag looks seriously perfect for the beach! I love that it's waterproof. and that it's orange. something about orange just screams summer to me! Agreed on the orange! I love bright colors for summertime, and there's nothing like a statement bag to make any outfit pop! That's why when I found this super cute bag, I had to include it! Great post! I love your graphics lately, girl!